You may need permission to do work to your property, or to lop any tree in the Grange. Your trees are the subject of a Tree Preservation Order (TPO). This map shows the Grange Conservation Area in the dark grey shaded shape. 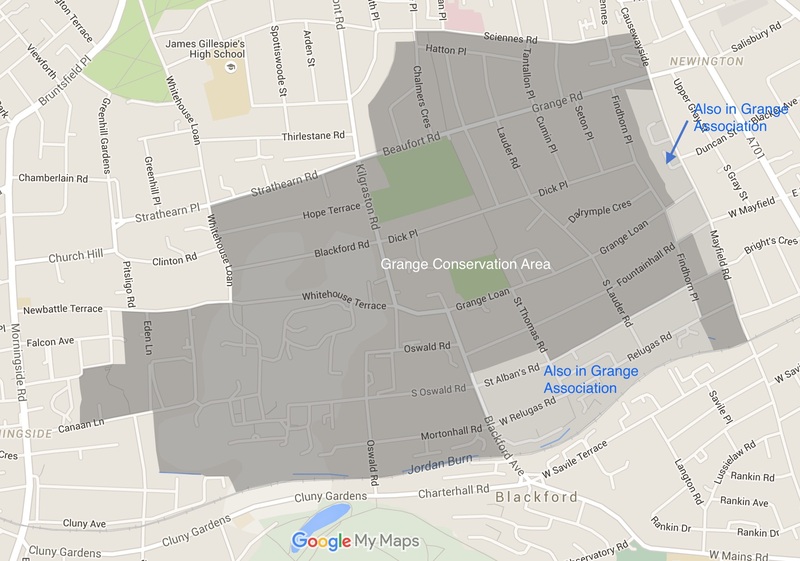 Most properties within the Grange Association area are inside the Grange Conservation Area. The characteristics of the Grange Conservation Area are described in the Council’s Conservation Area Character Appraisal. The Historic Environment Scotland website provides an online search facility. We recommend “Search using the map” which allows you to zoom into your street. Listed buildings are identified by coloured dots, depending on whether they are A, B or C listed. Clicking on the dot gives access to the listing particulars. The grade of listing makes no difference to the rules concerning whether you need to apply for permission for work (but will affect the decision criteria applied by the Planning Department). The Council’s website provides a helpful interactive map showing details of TPOs and the Conservation Areas in the City of Edinburgh. The green shapes are Conservation Areas; the grey shapes show the extent of each TPO, which may cover a single tree or an area of trees. Clicking on the shape will show the details and the TPO number. If you plan any building work on your home, you may need to apply for planning permission (FUL). Work that affects only the internals of a property does not need planning permission but, if the property is listed, it may require listed building consent (LBC). Building work includes work in the garden (e.g. garden sheds, driveway, new garden wall, new gates or fences). To determine whether you need permission, check the Council’s Guidance for householders (available for download here). That applies to all development in Edinburgh. There are more stringent constraints set out in the additional Guidance on listed buildings and conservation areas (also available for download here). If you are unsure whether the work you are proposing (or which has already been completed) is lawful, or whether you need planning permission or LBC, you can apply for a Certificate of Lawfulness (CLP). All building work, external or internal, must comply with building regulations. Structural work will require a Building Warrant. Check the Council’s website for Building Warrant advice. Work on gas services and appliances must be performed by a registered Gas Safe installer. Most significant electrical alterations, and any electrical work in kitchens or bathrooms, will require inspection and approval which is normally achieved by self-certification by an accredited electrical ‘registered installer’. Work on water services must comply with the water byelaws. The tree is either in a conservation area or is the subject of a TPO. Work on trees within a conservation area must be notified to the Council as a TCO application. Work on trees that are subject to a TPO must be authorised by applying for permission. There is a helpful document providing guidance on protected trees available for download. The application routes for both (TCO and TPO) are accessible from the Council’s web page on privately owned trees. If you are planning a project to your property in the Grange, you should refer to the page “Applying for Planning Permission” which explains the process. These booklets are for guidance only and exceptions can be made if the case can be justified. However, all development should conform with the current (Nov 2016) Local Development Plan (LDP) which contains a large number of policies which are adhered to in all but exceptional circumstances. The LDP policies are indexed on page 160 of that document. You may have been made aware that a neighbour has applied for planning permission. If so, you can check the application on the planning pages of our site. You can lodge a comment on any planning application directly on the Council’s web portal, accessible from the links on our planning pages against the relevant application. Check that the period for comments has not expired. We would encourage you generally to speak first with the property owner if at all possible, or ask us to do so on your behalf, before lodging an objection with the Council. Planning issues can sometimes lead to serious conflict between neighbours if not handled sensitively. Sometimes minor changes to the plans can leave both sides happy. The Grange Association will not submit an objection to any application from a member without attempting to discuss it with him or her first. To be effective, an objection should show how the plans would contravene the planning policies or planning guidelines, quoting the specific policy. We request that you copy any comments to us. We will respect your anonymity if you so request. If you are concerned about a development or tree work which is already taking place in your area, you should first check the planning application (if any) on our planning pages. Note that tree work appears on separate pages from planning applications. Some minor development is allowed under Permitted Development, such as like for like repairs to windows but, if you think a development is unauthorised, you can report it to the Council’s Enforcement team. This can be done online. We would encourage you always to speak first with the property owner if at all possible, or ask us to do so on your behalf, before lodging an enforcement request with the Council. Some matters may turn out to be misunderstandings which can be resolved easily without involving the Council. The Council’s enforcement team is busy and needs to prioritise its attention. Therefore, lodging an inadequately formulated enforcement request can lead to the case being dismissed promptly and recorded as such, which then limits opportunities for other residents or this Association to lodge a more considered request. The Grange Association is happy to give information about planning matters, whether you are concerned about proposals your neighbour is putting forward or whether you yourself are planning an extension to your house or just minor changes to your driveway. We would encourage you to be open about your plans for changes to your property and you are welcome to use our online forum to explain a planning application before you submit it. It is always best to talk face to face with your immediate neighbours before submitting a planning application to avoid misunderstandings. Members of the Grange Association will be notified by e-mail of material planning applications (including LBC applications, but not applications for tree work) if they stay in the same street or have the same postcode (excluding final letter) as the application site. Members should please ensure we have your e-mail address and that you have given us GDPR consent if you want to receive these alerts. Please then give us your views to inform whether we should submit any comment or objection. All comments or objections submitted by the Grange Association are made publicly available immediately by being posted on our website against the relevant planning application. Your Blog is very interesting and helpful. Thanks for sharing with us.